The first rule of Vedge is: you always talk about Vedge. You won’t be able to help it. Each dish at this Philadelphia restaurant takes recognizable seasonal ingredients—radishes, mushrooms, carrots, potatoes—and transforms them into perfectly balanced concoctions that you’ll discuss as you eat them, trying to get at their secrets like you’re playing a game of Clue. You’ll sip and sniff and lick and try and figure out how on earth this vegetable was transformed into that taste just by smoking it, or how those herbs combined with these condiments to make magic. And that’s part of the joy of it. Not that the food needs discussion to make it delicious, but that the food itself becomes an activity your whole table participates in. Like dinner theatre that you produce yourself. Vedge is a plant-based restaurant, so all of its dishes are vegan. I imagine for some this would be either an active draw or a hurdle to overcome. For me, it’s merely the parameters within which brilliant innovation happens. Chefs Richard Landau and Kate Jacoby aren’t trying to disguise vegetables. They are simply taking vegetables seriously by acknowledging their potential for the same range and depth that chefs have long demanded from meat. Neither are they simply celebrating what vegetables naturally taste like (which is delicious) but also all the other things they can taste like. They’re trying to dig deeply into them. Extract all the prismatic shades of each ingredient’s flavor, smell, texture, and application. For all this ambition and care, Vedge’s menu is playful and accessible. 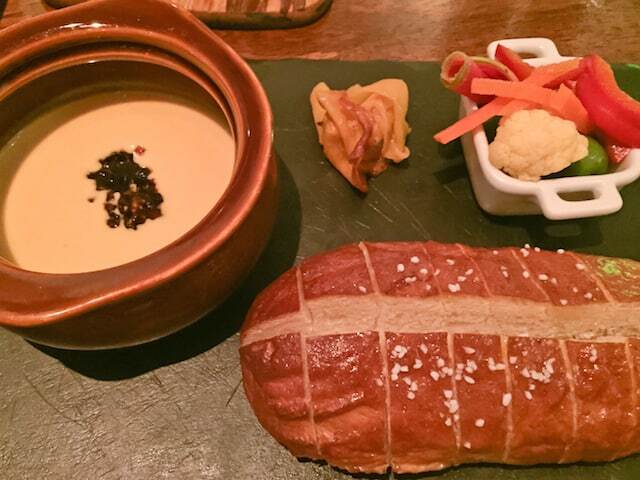 My two favorite dishes are the rutabaga fondue and the carrot reuben. The rutabaga makes a sauce so creamy I wanted to eat it like a soup. Fortunately, it’s served with a loaf of buttery soft pretzel and tangy pickled veg, so you don’t need a spoon at all. 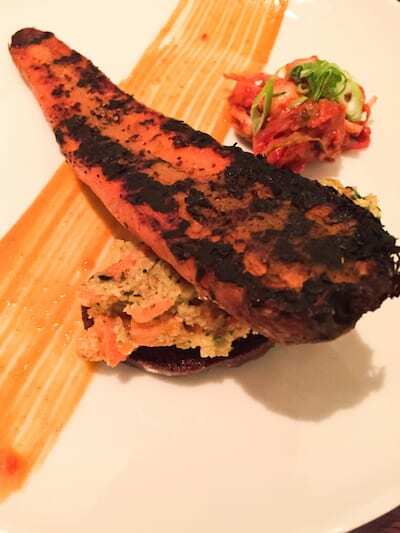 Vedge’s take on the reuben—probably my all-time favorite sandwich—features a slab of wood-charred carrot and sauerkraut puree on pumpernickel crostini with kimchi, atop a streak of some magical sauce that is a hundred times better than Russian dressing. The desserts are similarly impressive, and because the food, for all its depth, is light, dessert is a must. Vegan desserts tend to draw fire for being iterations of “real” desserts. As with the savory food, though, Vedge’s desserts are all about showcasing and manipulating ingredients rather than disguising them to approximate something else. 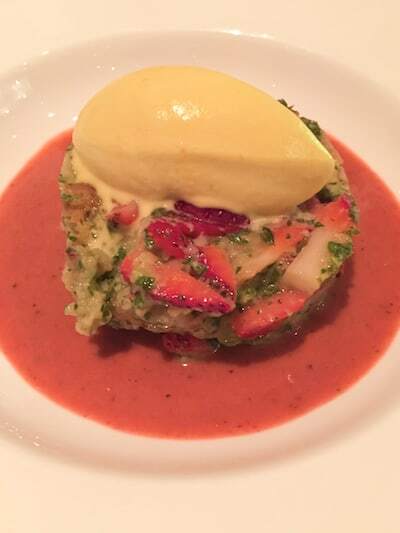 The strawberry-sorrel bread pudding is served in a strawberry gazpacho with saffron ice cream and it is the very taste of late summer, the sorrel bringing out a dimension I haven’t found in any other strawberry dessert. The blueberry cheesecake with poppy ice cream and lemon gel functions much in the same way. 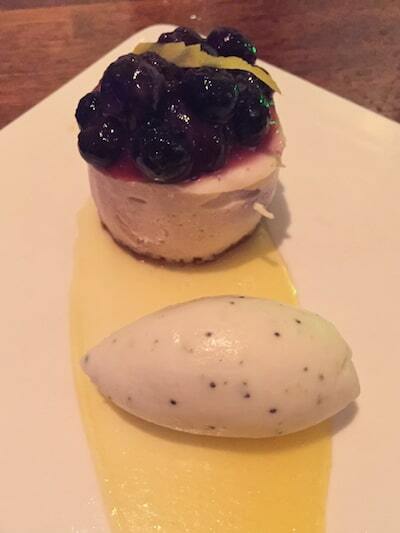 The lemon, poppy, and blueberry work in precise harmony and the cheesecake is the creamiest I’ve ever tasted. And none of that even mentions the cocktails. Which … I only have two words for you: absinthe rinse. Oh, okay, fine, here’s another three: blueberry-lavender syrup. Vedge isn’t the kind of cheap place you pop into on a whim (though, for that, there’s happy hour and the newly-opened V Street), but it isn’t prohibitive either. And that suits it. Because, above all else, the sense I get eating at Vedge is that it’s a pretty nerdy place. These are folks who absolutely geek out about food. You can taste the delight in the dishes and it’s transmitted via the knowledgeable and passionate waiters, who drop off each plate with the kind of sly, knowing smiles that say they’ll just be right over here while you try and puzzle it all out. The first time I ate there we ordered a dish of radishes done five ways and, upon tasting each variety, I said (the very picture of eloquence) to my sister, “but … but … radishes!” and our waiter, passing by, winked at me, clearly delighted and glanced at the plate, saying, “I know, right?” on his way to get our next course.